Below you’ll find cast iron related posts since last Tuesday. “Are You Stuck on Teflon Pans?” Well, don’t be. It’s bad for you. “Do It Yourself Tortillas.” What do you need for tortillas? A cast iron press. 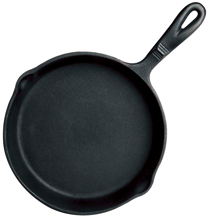 “Obsession Alert: Enamel Cast Iron Cookware.” Diana writes about her obsession. It’s okay, the folks here can relate. “Who Knows Where the Time Goes?” Molly is back from her wedding celebrations, so whats better to do than bake bread in a dutch oven? “Natanis Point Campground.” A blogger writes about his family camping trip which involved among lots of other activities, dutch oven cooking. Great pictures in a slideshow, too. “Done Friday.” After using a dutch oven to cook a ham, this blogger may abandon a conventional oven altogether. “A Good Bread Day.” The bread came out great. And why wouldn’t it? She used a Le Creuset oval dutch oven. “Cooks Share Expertise, Recipes at Dutch Oven Event.” Read all about the event that took place in Sioux Falls, South Dakota last weekend. “Teens Learn About Cooking.” Silver Springs, Nevada. “Last week, youths that participate in the Teen Summer Program learned about different types of cooking” including dutch oven cooking. “Fortuna Society Shows Another Side of Cooking.” A profile of Marv Rutledge of Fortuna, California and the Fortuna Dutch Oven Society. “My Indispensable Kitchen Gadget List.” Amy lists her indispensables for the kitchen which include a cast iron griddle and a cast iron press.